Crockpot Freezer Meals are great. I love being able to pull a meal out of the freezer, put it in the oven or crockpot and not have to slave in the kitchen all day on those busy days when you just don’t have time to cook…or don’t feel like cooking. If you haven’t read up on what this is all about, start at my Crockpot Freezer Cooking. Then come back and you can get going on the actual Freezer Meals. When prepping your Crockpot Freezer Meals, get your freezer bags out ahead of time. Write the Meal on the bag and instructions. After adding all ingredients, squeeze out as much air as you can, lay flat to freeze. You may have to adjust cooking times. All slow cookers/crockpots are also different so just watch your meals and adjust accordingly. Sometimes you might also just need to add a bit of water to your slow cooker or crockpot to keep it from cooking dry. Make sure to also check out my Bulk Cooking Tips. Add all ingredients to bag and freeze. Thaw slightly and add to crockpot. Cook on high 1 – 1 1/2 hours until pasta is tender. Add 1/2 bag of mozzarella and cook until melted. Add all ingredients to bag (except carrots) and freeze. Add beef, onion, garlic, peppers, ginger, water, beef bouillon, and soy sauce to the bag. When beef is almost done, mix 2 T cornstarch and 1/4 C cold water and then mix into beef mixture. Increase heat to high and cook 10-12 min longer or until it’s thickened. Add meatballs, onions, soup and mushrooms in bag and freeze. During last hour, stir in 1 package of cream cheese and 8 oz of sour cream. Serve over hot pasta or rice. Add all ingredients to bag, toss to coat and freeze. *tip – do not over cook or the broccoli will be really mushy. I over cooked and the presentation of the dish did not look tasty but it was still delish! Baked Ziti out of the freezer bag. Hope you enjoyed the Crockpot Freezer Meals Comfort Food Series. You can find the printer friendly version here with Shopping list. Thanks, Saving You Dinero for a couple of the great recipes! My husband loves when I do a roast in the crockpot. I’ve never tried it with the ranch seasoning but it sounds delicious. I am going to have to try it that way for him next time I make it. I am very excited because I bought everything I need to make the roast meal when I went to the grocery store yesterday. Can’t wait to taste this new variation on it! Thanks so much for these recipes! I love having meals like this in the freezer for when I just don’t have time to cook. These all look really good. But I can’t see any place as to how many servings each is. Kid are all gone just the 2 of us. Anxious to try some. My husband loved the roast. We tried the ziti tonight and it was gritty. May try it differently next time. I was wondering when you say 4T in the recipes, do you mean 4 teaspoons? I just want to make sure the measurement is correct when I make these. Thank you! capital T would be tablespoon and a small t would be teaspoon. 🙂 Hope you like them! Great idea! Can’t wait to read more! With the Honey Sesame Chicken you say to thaw it slightly but how long would you thaw it for yourself? I just thaw it enough to get it out of the bag easily. Maybe 3-5 minutes in the microwave is all. I love the blog site design. How do you make it. It is actually cool. What’s the theme your using? For the honey sesame chicken, you said you used breaded chicken tenders? What type? Think frozen popcorn chicken would work? Sounds good but can’t find any other recipes with breaded chicken. Please let me know how this would come out. I believe it was just Tyson brand. I think popcorn chicken would be very similar to what I used. I don’t think that was what was intended in the original recipe 😀 but it worked just fine. I’ve never seen an 8 oz box of ziti. Do you really mean a 16 oz box? Just want to clarify since that would make a big difference! Thanks! Just wondering how big the portions are? It’s just my husband, my toddler (who doesn’t eat much), and myself. Would I be able to half the meals before freezing or would that make them too small? It depends on which recipe. I cook for a family of 6. Some days they eat it all up, some days I have left overs and some days I don’t have enough. I can’t ever get it right it seems. 🙂 None of these recipes are overly large. I’m expecting you’re still going to have left overs though if it’s just the 2 +1 that you’re feeding. I think you could half them – split the recipe up in 2 bags so you have double the meals. Might just have to give it a try with one and see how it goes. Thanks for sharing these amazing recipes! I plan to prepare the Honey Sesame Chicken this week! I’m going to try the Meatball Stroganoff tonight, but will be making homemade meatballs. Hi! 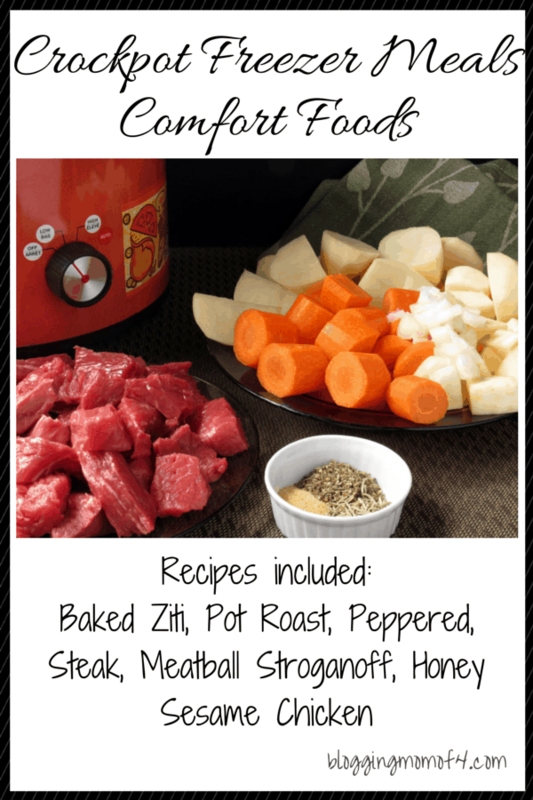 I am going to be making up some crock pot freezer meals, and I was wondering why you say not to freeze the baby carrots in the pot roast recipe? I was planning on using frozen carrots… So I didn’t know if there was some other odd reason why you specified not to freeze them! Thanks! I’m so glad I came across your post. These dishes are going to be great for the winter nights coming soon. My husband loves to eat hearty in the winter.